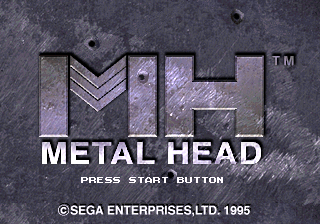 Metal Head (メタルヘッド) is a Sega 32X action game developed and published by Sega. Metal Head is an early first-person shooter, in which the player controls a bipedal mech tasked with destroying enemies on the map. It is one of the few 32X games to take place in a full 3D environment (with textured polygons), though comes at the expense of relatively low draw distances and frame rates (averaging between 10FPS and 12FPS during gameplay). There is also a large amount of digitized speech. Despite the US box claiming otherwise, Metal Head is a single player game. Metal Head was first announced in mid-1994, although at the time the game was in a very early state of production, with the only available footage being pre-rendered scenes and technical demos. It was originally planned to be a launch title for the 32X, however a series of troubles put the game back a few months until early 1995. Main article: Metal Head/Magazine articles.